All our full removal prices are worked out by calculating the cubic feet required for the items we are moving, the distance between your old and new property and whether you opt for additional services such as packing. It’s a very simple and cost effective way to give you an all inclusive price so that you are only charged for the items that you require moving. To provide you with your quote we need you to complete the online form below with your details and those of your move. 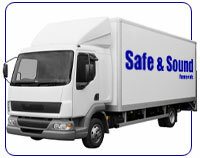 Or you can call us and we can arrange to carry out a survey of your belongings in the comfort of your own home. Alternatively please see our rate tables below for ‘man & van’ service. All prices include a working man with van and fuel within a 10 mile radius. Additional mileage will be charged at 50p per mile. All our vans are equipped with satellite navigation, protective blankets and ratchet straps to look after your belongings while in our care. •	A 20% deposit is required at time of booking to secure the removal date for a 2 bed+ house removal. Payment in full is required on the date that our service is completed.